Sony hopes that the third time will be the charm for its oft-rebooted superhero property. On Friday, July 7, Sony Pictures (SNE - Get Report) will release "Spider-Man: Homecoming" into 4,348 theaters across North America. Sony Corp. hopes the film will revive the valuable property, while the industry looks to buoy what has been a disappointing summer at the box office to date. "Homecoming" represents Sony's second attempt at rebooting the franchise, after the Andrew Garfield-led "Amazing Spider-Man" films ($1.5 billion combined worldwide gross) failed to live up to the heights of the original "Spider-Man" trilogy directed by Sam Raimi and starring Tobey Maguire, which brought in nearly $2.5 billion worldwide. After "The Amazing Spider-Man 2" underwhelmed with $709 million worldwide in 2014, the studio went back to the drawing board to figure out how to make its most lucrative property a juggernaut once more. The answer was to fold Spider-Man into the most popular superhero franchise at the moment, Walt Disney Co.'s (DIS - Get Report) Marvel Cinematic Universe (MCU). Disney and Sony struck a deal in 2015 wherein Kevin Feige, president of Disney's Marvel Studios, would oversee the creative direction of the character while Sony would finance the new "Spider-Man" movies ("Homecoming" cost $175 million before marketing). Sony will retain all the box office revenue from the new "Spider-Man" films, while Disney gets to keep the money from merchandising as well as have Spider-Man interact with other Marvel characters within the MCU. 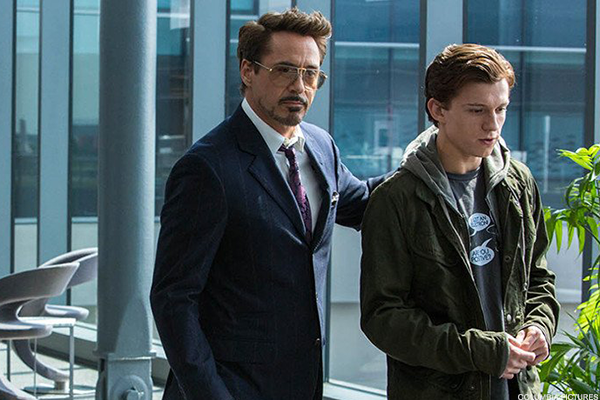 Robert Downey Jr. and Tom Holland in "Spider-Man: Homecoming"
Robert Downey Jr.'s Iron Man, for example, plays a supporting role in "Spider-Man: Homecoming" and has been featured prominently in the marketing. Tom Holland, the new actor portraying Spider-Man, already has won over a large number of Marvel fans with his appearance in last year's "Captain America: Civil War." Although his role in that film did not amount to much more than a glorified cameo, Holland's performance was one of the most widely praised aspects of "Civil War." As the inclusion of Spider-Man helped the Marvel film gross $1.15 billion at the worldwide box office, Sony is hoping Iron Man's appearance will help "Homecoming" become a global blockbuster. It's a smart move -- no film featuring Iron Man has ever opened to less than $98.6 million at the box office, as Robert Downey Jr.'s Tony Stark is arguably the most popular character in the MCU. The synergy between the two properties will be on further display next year, as Spider-Man is reportedly a key player in Disney's next "Avengers" film, set for release on May 4. If the big bucks continue to roll in, property sharing between studios could become more popular down the line. "I think it definitely could set a tone for other studios, because it looks to be a win-win for both Disney and Sony," said Shawn Robbins, chief analyst for Boxoffice.com. "The strategy is unique, and so far we're seeing that it's working, just based on the reviews and the buzz." Indeed, the box office take for "Spider-Man: Homecoming" is already impressive, capitalizing on ecstatic reviews and a fairly weak marketplace. In its Thursday night previews, the superhero film, which sports a 94% rating on review aggregator Rotten Tomatoes, grossed $15.4 million, ahead of recent hits such as Marvel's "Doctor Strange" ($9.4 million) and Warner Bros.' (TWX "Wonder Woman" ($11 million). Those films took in $85.1 million and $103.3 million, respectively, in their opening weekends, and "Homecoming" seems sure to surpass those numbers in its debut. If it does, it would be the third superhero film to open over $100 million this summer, along with "Guardians of the Galaxy Vol. 2" ($146.5 million) and "Wonder Woman." "Superhero films have been a real bright spot for the industry," comScore Inc. senior analyst Paul Dergarabedian said. "Back in June, the summer was down 9% year-over-year, and the big infusion of cash from 'Wonder Woman' turned things around [momentarily]. Now the industry is banking on 'Spider-Man' to save us from another 9% summer deficit." Outside of the superhero genre, it's been a rough summer at the box office, especially for franchise fare. The past four weekends have seen four reboots or sequels disappoint in their domestic openings, with "The Mummy" from Comcast Corp.'s (CMCSA - Get Report) Universal Studios, Disney's "Cars 3," Paramount Pictures' (VIAB - Get Report) "Transformers: The Last Knight" and Universal's "Despicable Me 3" all failing to live up to expectations and the openings of their predecessors. Franchises were once the bread and butter of Hollywood studios, but sequels now are risky propositions unless they feature superheros. 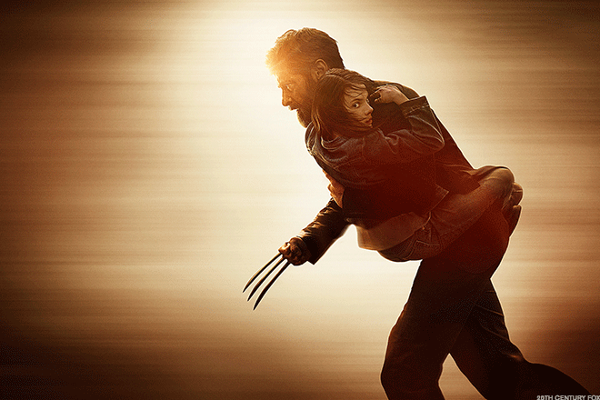 This year, three of the five highest-grossing films domestically belong to the superhero genre, with 20th Century Fox's (FOXA gritty Wolverine sendoff "Logan" joining this summer's "Guardians of the Galaxy Vol. 2" and "Wonder Woman." In all likelihood, "Spider-Man: Homecoming" will bump "The Fate of the Furious" out of the top 5, leaving only the year's highest-grossing film, Disney's live-action "Beauty and the Beast," without a superhero. The sturdiness of the genre has led studios to increase the amount of superhero content in the pipeline, and now a record-breaking nine superhero movies will be released in 2018. (Ten if you stretch the definition to include Pixar's animated comedy "The Incredibles 2.") With that amount of spandex in the marketplace, oversaturation is a natural concern. That being said, box office analysts are not worried yet. "Audiences are embracing superhero movies, and if the quality of the content keeps up, I think that trend keeps going," Dergarabedian said. Robbins added, "The superhero film is the modern-day Western, in a lot of ways." Not only will next year's "Avengers" film see Tom Holland reprise his role as the web-slinger, but Sony also has Spider-Man offshoot "Venom" scheduled for the fall of 2018. The film will feature Tom Hardy ("The Revenant," "Dunkirk") as the eponymous nemesis of Spider-Man, and Ruben Fleischer ("Zombieland") will direct. The movie is intended to be the first of several Sony films featuring Spider-Man characters, as the studio may create its own extended universe based around the superhero property. An animated Spider-Man feature also is set for release next year, and Silver Sable and Black Cat, female characters from the "Spider-Man" comics, reportedly are getting their own movie, with "Thor: The Dark World" writer Christopher Yost set to pen the screenplay. 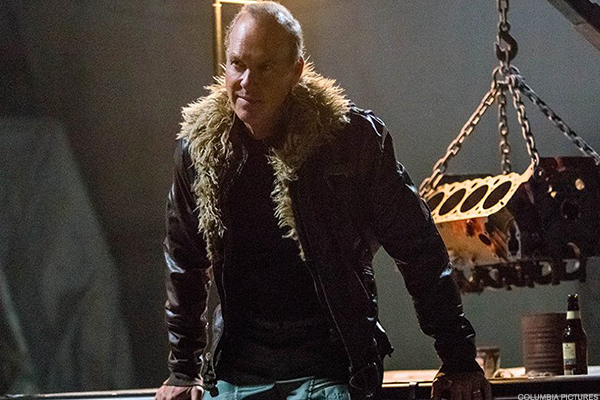 Michael Keaton in "Spider-Man: Homecoming"
So long as the superhero fever keeps up at the box office, Sony probably can expect to reap a considerable profit from the films. If the market does reach a point of superhero oversaturation, though, the studio may have to rethink the strategy of giving minor Spider-Man characters their own films. Sony would not comment for this story outside of a statement on the release of "Homecoming." With Disney cranking out Marvel movies, Warner Bros.' DC hitting its stride with its characters, and Fox continuing with the "X-Men" franchise, the landscape is arguably more competitive than it has ever been. One thing is for certain, though -- if Sony can keep up the enthusiasm around Tom Holland's Spider-Man, something the studio has done an excellent job with so far, then future films centering around the hero seem sure to achieve box office success. At the end of the day, that is the big story for Sony: the restoration of its billion-dollar franchise. "This is one of the premier superhero characters," Dergarabedian said. "Sony is never going to give up on Spider-Man."